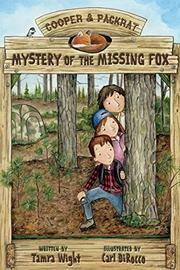 In this third whodunit, Cooper wonders: who is poaching the fox kits from their den? There's lots of action, good and bad, going on at the Wilder Family Campground. Their campground is about to get big-time publicity when it’s featured on a reality TV show whose starring family will vacation there. But Cooper's dad has a serious accident while felling a tree, and Cooper feels responsible. He wasn't there to help him—instead, he was watching five fox kits emerge from their den with his friend Summer. When word spreads that the Wilders need help readying the camp, Cooper's friends, including Packrat, arrive to pitch in. But they soon notice that the kits are disappearing, one by one. Suspects emerge: the harrumphing Cat Lady who blames the disappearance of her cat on a fox, and another camper, Vern, who carries a raven on his shoulder. And, why is Summer so secretive about the art her father is creating? Wight neatly develops likable, quirky characters, and she artfully weaves in a host of kid-magnet subjects: zip lines, water fights, three-legged frogs, and uber-stinky sneakers. Readers will love the hilarious, heart-pounding scene when the mystery is resolved—as well as the charming denouement. DiRocco's fine illustrations heighten the book's appeal, though they reveal the cast to be a largely white one.